Browse for Vidéo à la demande d’Orange. 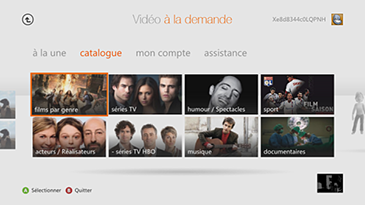 Select Vidéo à la demande d’Orange to download and install the app. After the download, the app starts automatically and you can browse through the catalogue and view details about the available content. To start Vidéo à la demande d’Orange later, go to tv & video, My Video Apps, and then Vidéo à la demande d’Orange. Non-Orange customers can navigate through the application, browse video catalogue and see video information, trailers and film critics’ and customers’ opinions, but cannot rent videos. Go to tv & video, My Video Apps and then Vidéo à la demande d’Orange. à la une displays recent films and featured content added this week to the catalogue. catalogue – Displays content by category, such as films, TV series, sport, documentaries, etc. mon compte – Allows you to go to the Mes vidéos screen. Mes vidéos shows a list of videos that you have rented and can still view. Each item shows the video poster, title, parental control indicator and time limit of the video’s availability. You have 48 hours to watch a video after renting, and you can watch the video as many times as you want. Select a video to begin playback. Vidéo à la demande d’Orange provides two ways for payment. The main way is your Orange Internet bill. The price of the rented video is added to the Orange Internet bill that you receive at the end of the current month. The secondary way to pay is through the use of gift vouchers, which are provided by Orange customer service. Payments and purchases are not supported through Xbox billing. For all billing and account support questions, contact Vidéo à la demande d’Orange by phone on 01 55 22 22 22. 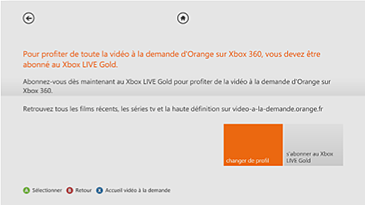 If you use Family Settings to control which films and TV shows can be watched through Xbox Live, the Vidéo à la demande d’Orange app will follow those settings. Videos will be either blurred out (and displayed with a warning across the front) or replaced with a grey block if the parental guidance classification of the video does not fit with the Parental Control settings defined by your Xbox console. You can unlock the parental control for the current session by clicking on “débloquer” (unlock) button and entering your parental pass code. 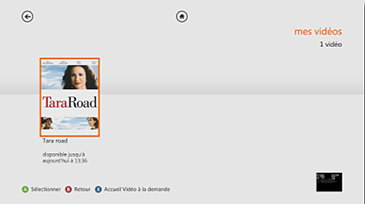 ¿Quieres contactar con el Soporte técnico con referencia al problema "Set up the Vidéo à la demande d’Orange app on Xbox 360" acerca del que estabas leyendo o con referencia a otro problema?